Did you know you can vaccinate your cattle for “blackleg disease”? Clostridial diseases are caused by a bacteria called Clostridium and are commonly referred to as “blackleg”. These bacteria can live up to several years in soil, water, or decomposing plant and animal material. There are eight different types of clostridium that can be deadly to cattle. To cause disease, the clostridium bacteria need an opportunity to enter and multiply in the tissue. Wounds from trauma, mild abrasions caused by branding, dehorning, castration, and/or improper technique and hygiene when injecting any medication, including vaccines, put cattle, especially young stock, at high risk to get this disease. Proper vaccination schedule following your veterinarian’s recommendation with a seven- or eight-way product is the most effective and economical way to effectively prevent this disease. If a producer suffers the loss of young stock because of blackleg, they are losing hundreds of dollars from the loss of the weaned calf, and also putting the rest of the unvaccinated herd at higher risk to get this disease. The financial loss from one weaned steer would more than cover the costs of entire herd vaccination. The Farm Animal Ambulatory Service can help you decide what is the best product and schedule that fits your budget and management system to provide the best protection to your cattle herd. A portable cattle chute (head catch) is available and can be transported to your farm to help work cattle safely and timely. 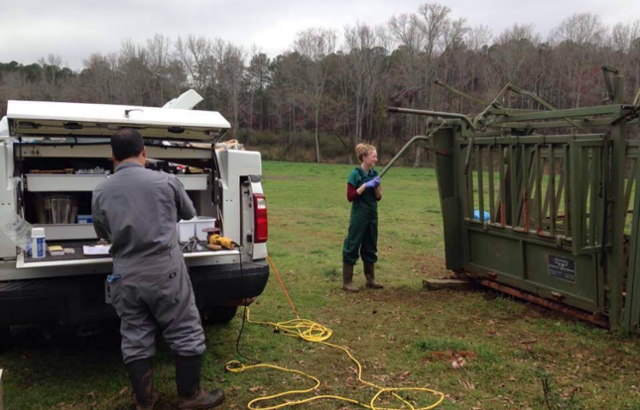 The AUCVM Farm Animal Ambulatory Service, led by Dr. Ricardo Stockler, provides on-farm veterinary care in east central Alabama and west Georgia. Dr. Stockler can be reached at 334/844-4490 or by email at rms0047@auburn.edu for consultations and appointments.